Amazing Grays » Blog Archive » Is Jaime Lee Curtis an Amazing Gray? Is Jaime Lee Curtis an Amazing Gray? Ever wish you could have a do-over? 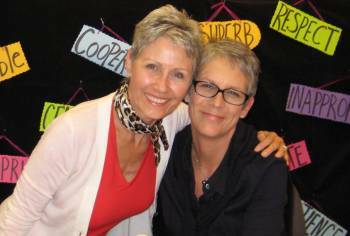 Over a year ago I met Jaime Lee Curtis at a book signing for one of her children’s books (my granddaughters love them!) When she first saw me, she gushed “My twin!” It was very sweet. Yes, there are some similarities in our haircuts and bone structure as you can see from the photo – but that’s probably where the similarity ends. Her celebrity life and my everyday life are worlds apart. I gave her a copy of Amazing Grays and included a note inviting her to submit her “after” photo to my online Gallery of Silver Sages to “prove” she was one of us. If you’re listening Jaime – I apologize. You don’t need to prove anything to anyone – and had I given my note more thought I would have simply said – please accept this gift…and enjoy the read. You already exemplify what Amazing Grays is all about – women who are beauty-full, vibrant, mindful, healthy, physically fit, desirable, wise and passionately engaged with life. Going gray in such a tough industry couldn’t have been easy – and I applaud your courage. Yes, it takes courage to buck the norm…so I also applaud all the everyday Amazing Grays out there – whether you are blonde, brunette, red, black, white or silver. WE don’t need to prove anything to anyone either – we just need to show up for our lives and show the world what we’re capable of – regardless of age or hair color. hoo-ah! This entry was posted on Wednesday, August 25th, 2010 at 12:49 pm	and is filed under AMAZING GRAYS Blog. You can follow any responses to this entry through the RSS 2.0 feed. You can leave a response, or trackback from your own site. I admire Jaime Lee a great deal – as an actress, an author, a person of the world. I’m often told I look like her and after viewing this photo, I can see why folks think that. Thanks for the post.